Cel.ly is primarily a free group texting service. Group texting saves time, improves communication, provides documentation of texts, and sets the stage for easily using many other cell phone tools. The Cells referred to in Cel.ly are instant mobile networks. 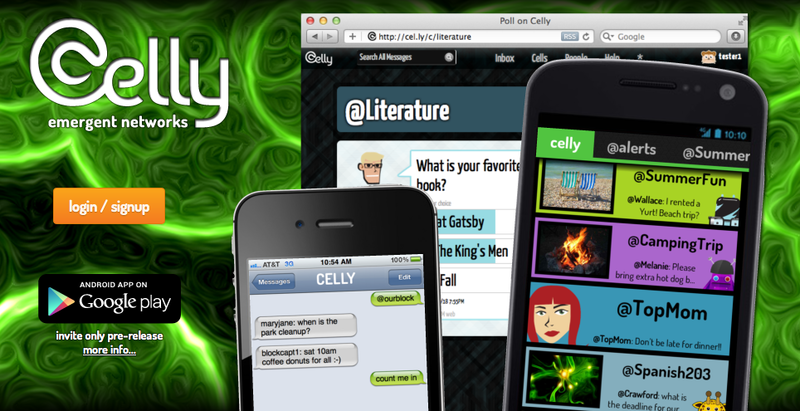 With Cel.ly, you can have open group chat, one-way alerting, or a hybrid where curators can approve messages. 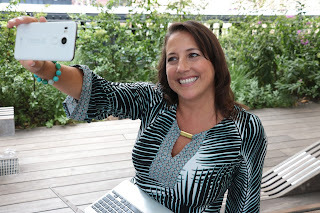 Cel.ly also provides security and privacy as phone numbers are never exposed and there are controls. Cell curators filter messages before they are sent to the group. This keeps discussion on-topic and reduces abuse, impersonation, and cyberbullying. An @me feature lends itself to note taking. Cel.ly even has a built-in polling feature complete with the tabulation of results. Melissa Seideman ‏- High school history With administrative and parental approval, high school history teacher Melissa Seideman uses Cel.ly to send text message reminders, announcements, polls, and questions to students. Cel.ly supports instruction and creates an environment where every student has a chance to “voice” his or her opinion. For example, when she shows a short video clip Seidman has her students text one significant fact or detail they learned to Cel.ly. Afterwards she highlights important topics from their messages. It is an interesting way to gauge student comprehension, involve all student’s, and start a discussion. Cel.ly has also improved parent teacher communication in her classroom. Parents say they appreciated the text messages about their child’s learning and even enjoyed the in-class texting activities. Parents are now more informed about how their kids are doing and are better able to help their children with their learning, which is key to student success. Brandy Sparks - High school language arts High school language arts teacher Brandy Sparks, uses group texting with her classes to gather feedback after class discussions. Following a discussion, she sends her students a thought-provoking question. Sparks reports that the students’ responses are often of a much higher quality than the ones shared during class. She’s not sure if it is because they’ve had time to think and process or because they are getting to text it in, but she knows it works. Every student gets a chance to answer. A definite improvement over in class discussions. She also uses open chats to keep conversations going outside of class. All of the texts sent and received can be viewed from her computer by logging in on the Cel.ly site. School guidance counselor Willyn Webb says that Cel.ly has made a positive improvement for her school’s Parent Accountability Committee (PAC) which meets once per month. Before Cel.ly she found it frustrating to provide a clear picture of what was happening in school during their monthly meetings. Her solution was to invite them all to join her PAC Cell. At first they just communicated about logistics. For example, Webb used Cel.ly to set up a last minute Christmas potluck for their December meeting. Today, Webb sends a daily message that might be to share progress regarding service learning projects, academic milestones, praises for students and staff, struggles, and needs for improvement. As a result of Cel.ly the PAC is now communicating often and Webb says she feels great about keeping her PAC up-to-date and informed with the praises, growth, and challenges. Sandy Vickrey, Math/Science Teacher I learned the benefits of cues and questions to activate prior knowledge in my college education classes. In my school, however, class time was very short. I rarely took the time to cue students, ask questions, or discuss prior knowledge. Wait time did not seem to exist. When I learned about free group texting services like Cel.ly, I began using a group text for a cue or a question before school to all of my morning classes and at lunch to all of my afternoon classes. This really helped students come to class aware of the lesson content and ready to learn more. Book clubs Book clubs can keep the conversation going by interacting and discussing questions through an anytime/anywhere open group chat to which the teacher is invited. The teacher gets to be a part of every group and hear every student voice. Critical discussion The teacher sends out a critical thinking question to the students after school. The next day she shares all their responses and class time can be used for critical discussion rather than response collection. Note taking Have students set up a Celly for themselves and use the @me feature for easily taking notes, writing questions, or making connections while reading at school or on the go. When you are done inviting, text “X” to finishIf you need to invite a large group of people, consider having them text to join. For example, you would tell them the cell name, @readingclub, and have them text @readingclub to 23559 to instantly join. This way you don't have to manually invite each person. You can also login to the Cel.ly website and mass invite a list of people using email addresses, usernames, or phone numbers. For more information visit the website at http.www.cel.ly.com. You can visit their blog at http://blog.cel.ly/ or read these terrific step-by-step guides http://cel.ly/guides. Nice article. Group texting sounds like a great tool for staying in touch with a group. The spam filter and language control are great features. The privacy maintained by the provider is also great. With parents more involved than before in their kids education, it is good for teacher to stay in touch with parents and all times and keep them informed and updated about day-to-day or important stuff concerning their kids. To read about these educationists successfully using group chat is encouraging. I am sure it will get more popular by the day. Thanks for sharing.